Picking a digital oscilloscope can be a daunting process. You’ve got to navigate through potentially dozens of different specifications and costs. But once you’ve got a couple of critical details nailed down, it all gets much easier. Especially when compared to using an older analogue oscilloscope. Ending up with the right digital oscilloscope depends on your ability to answer a number of questions. Do you need to measure several signals simultaneously? What are the greatest and smallest amplitudes that you need the instrument to measure? What’s the greatest frequency? Are signals single shot or repetitive? While using the instrument, do you need the spectrum analysis in the domain? Apart from these types of technical details, which mostly answer themselves after you understand what sort of things you need your oscilloscope to do, it helps to have a broader look at the instrument’s ability to be used. Including throughput, portability, and so forth. Are you looking for a handheld instrument? You’ll probably have to sacrifice a number of features, or even accuracy. Alternatively, you might be looking for a PC based oscilloscope. They tend to have more robust feature sets, especially for people who are interested in annotating data. But those designs tend to be rather niche when it comes to practical use because of their dependent relationship on other electronics. For most people, for people who don’t need their instrument to literally be handheld, the best option is typically a benchtop unit. They provide the highest performance you can get without involving other components. But depending on how you plan on using the instrument, that’s really what should ultimately determine the form factor your select. Are you going to be on-site? Inside a vehicle? On some oscilloscopes, the listed bandwidth isn’t available for every voltage range. You need to carefully look over data sheets to ensure the precise range you’re looking for is supported. For the most part, you’ll find bandwidth either in the name of the product, or extremely prominently displayed. You can find oscilloscopes anywhere between 20MHz and 200MHz. You’ll also find both two channel and four channel designs. When you end up running a four channel oscilloscope, naturally you’re going to end up paying a little more for the extra hardware, and it can be especially difficult to find higher ranges of bandwidth support without going well past $400. When you’re using an analog scope, sample rates are wonderfully simple. You just select the bandwidth you want to use, and that’s it, you’re ready to go. But when you’re using a digital oscilloscope, you have to think about both memory depth and sampling rate at the same time. Digital oscilloscopes capture data samples into their memory, so the size of the memory buffer helps to determine exactly how long the instrument can keep a single before memory capacity is fully expended. Not too complex – you just have to have an idea of how much data you’re storing. The sampling rate should be twice the maximum frequency you’re interested in measuring — at least for a spectrum analyzer. For a digital oscilloscope, at least 5 samples are necessary to help reconstruct an accurate waveform. That has a pretty direct relationship to how many samples are necessary for any particular type of reading. For instance, an instrument might take samples at 100MS/s or 5 GS/s, depending on if you’re working with a repetitive wave form or not. Keep in mind that manufacturers tend to choose the specifications that sound best when describing their sampling rate. Consistent performance at all resolutions is not something you can take for granted when choosing a digital oscilloscope. As with almost any instrument that takes measurements, you probably need to concern yourself with the accuracy of those measurements. How much accuracy you need will depend on the kind of jobs you have in mind. Quality digital oscilloscopes should be able to detect minute changes in signal strength, even as small as 0.4%. 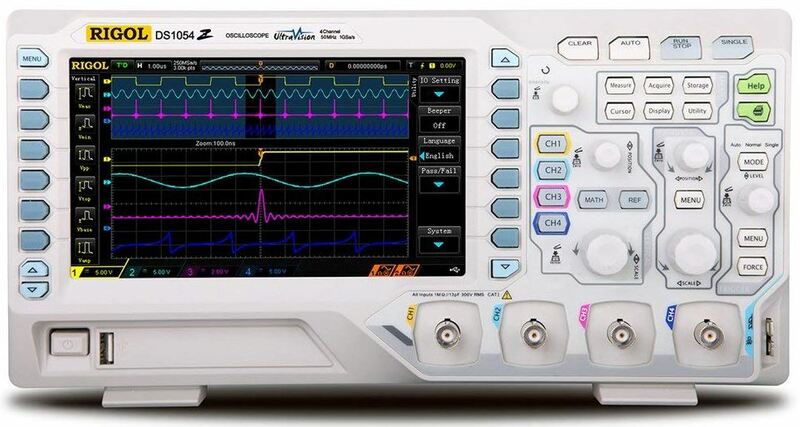 But because extremely precise measurements are generally not needed for oscilloscopes, instruments are often built to provide around 3-5% DC accuracy. You can find them a little better than that, but you do end up paying for every bit of added accuracy. So if you don’t need to move from 3% to 1%, you can save a bundle by sticking at three. Compared to their PC-based counterparts, digital oscilloscopes tend to offer a pretty small selectable range of inputs, generally ranging between ±50 mV to ±50 V. Higher voltages can also be measured when you start to use an attenuating probe, but you need to ensure the scope has enough voltage for the kind of signals you want to measure. 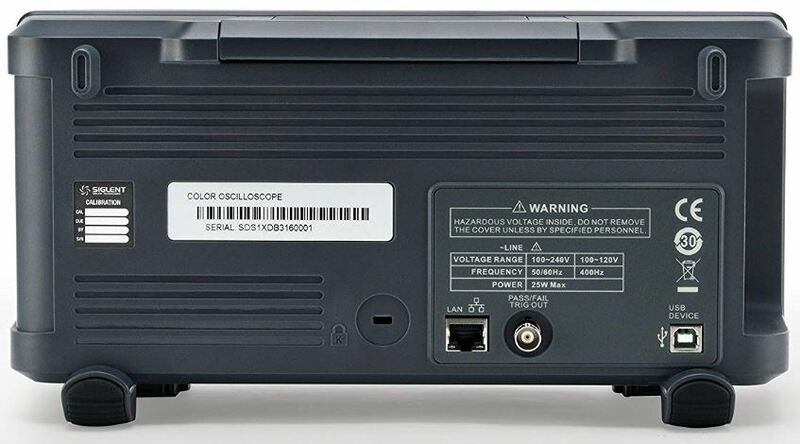 A 16-bit scope has an amazing 256 times the same resolution as an 8-bit scope, giving you a far greater ability to zoom your attention in on a microvolt signal. Without paying close attention to detail, you could say the Hantek DSO5072P is a pretty run of the mill digital oscilloscope. With a closer eye, you’ll notice this instrument is actually especially useful for a variety of automatic measurements. For instance, it includes four math functions, each of which follow FFT standards. 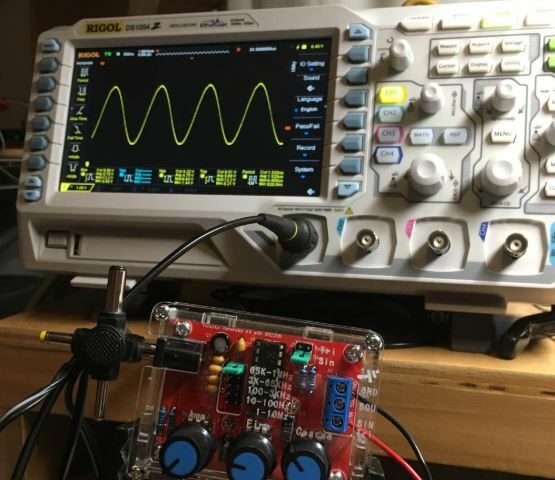 With the help of a low pass filter, this oscilloscope is able to convert the 80MHz BW scope into a 20MHz BW scope. Great for helping to smooth out and remove the noise that could otherwise disguise the real features of the waveform you’re trying to measure. The DSO5072P measures 11.8 x 15.8 x 7.9 inches and weighs about 4.6lbs. A pretty hefty table-top style unit. Like many similar digital oscilloscopes, it uses a very large 7” display. The display is actually a full color 800 x 480 screen, which makes data quite readable. If you want to export off the device, you can get data moved through a standard USB host to help connect with a variety of different devices. The DSO5072P delivers accuracy within a range of 3-4%, depending on if you’re using the normal mode or the average acquisition mode, and depending on the voltage. But the DSO5072P is most distinguished by its possession of a number of features that slightly exceed its price point. For instance, it’s able to support 200/100/70MHz bandwidth, while data comes out rapidly with the assistance of a 1GSa/s real time sampling rate. You basically have your data instantaneously. Plus, the DSO5072P has a recording length that stretches out to 40K. Operation is not totally intuitive, but that’s mostly a result of the sophistication of this instrument. But once you’ve got your bearings, you can quickly move between pulse width, slop, overtime, line selectable video, edge, and a variety of other common trigger modes. One thing to keep in mind, this instrument was constructed in China. The craftsmanship and general quality does seem to be up to par, and the scope includes a standard 110/120V power cable. The DSO5072P also includes a one-year warranty. The Siglent Technologies SDS1202X-E is just a tad more sophisticated than the DSO5072P. It’s got an input range of 500UV/Div, and a pretty innovative digital trigger system that allows you to maintain higher levels of sensitivity alongside lower levels of jitter. For people who are actually concerned about accuracy, that’s great news. To keep things simple, it uses a 256-level grading display, helping make your data a bit more approachable. Like many similar instruments, the Siglent oscilloscope offers a number of triggering modes and serial bus triggering. But compared to previous versions, the latest design of this instrument includes a new co-processor, which helps you get results quicker and more accurately. A pretty good combination. 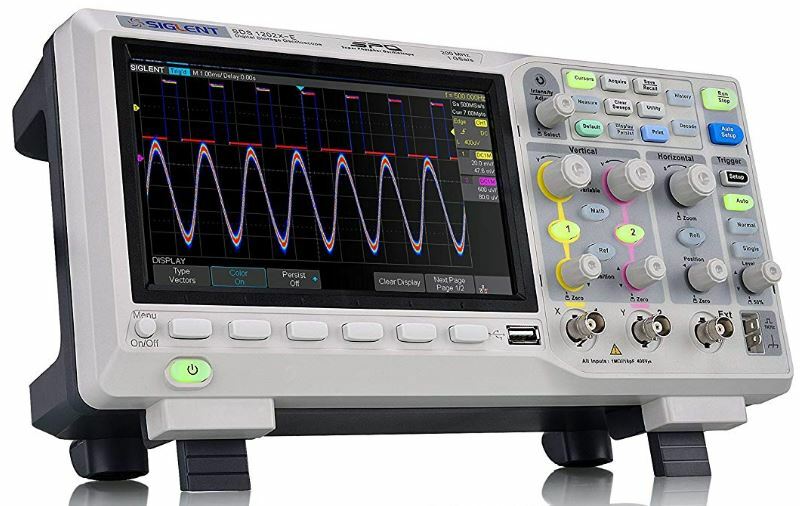 The Siglent SDS1202X-E is another full-sized benchtop digital oscilloscope. It measures roughly 12.3 x 5.3 x 5.9 inches and weighs just over 5.5lbs. But apart from the fairly standard design of the instrument, you’ll find this is a pretty modern tool. The SDS1202X-E makes use of the latest generation of Spo tech to help bolster the fidelity of its signal and overall performance. As a result, the noise system is lower than most oscillometers in this price range. The SDS1202X-Ewas constructed around a USB host interface, along with a LAN (VSI-11) port, and a pass/fail trigger output. That allows you to record up to 14Mpts of record length to get those higher sample rates. And then with the aid of the large on screen display, you can quickly zoom in to the regions of data that interest you the most. Its waveform capture rate reaches 400,000 frames per second while running in sequence mode. 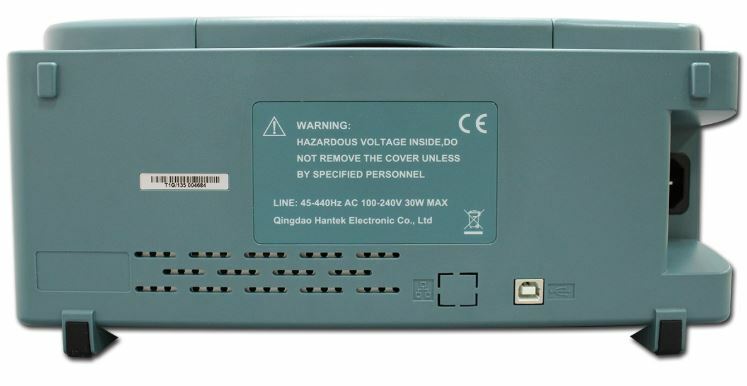 It features a real-time sampling rate that reaches up to 1GSa/s. And it can record a length of 14Mpts, including standard serial bus triggering and decode. Once your data has been collected, the 256-intensity grading trace function is represented by changes in different colors on the display, the color temperature, as opposed to the intensity of the color. Red colors show up to represent the frequency of an event, while blue is used to distinguish the points that occur with the lowest frequency. Wonderfully intuitive, and it makes higher throughput for readings possible as well. TheRigol DS1054Z was built with a highly approachable interface, making this instrument a good choice for students, hobbyists, schools, and so forth. 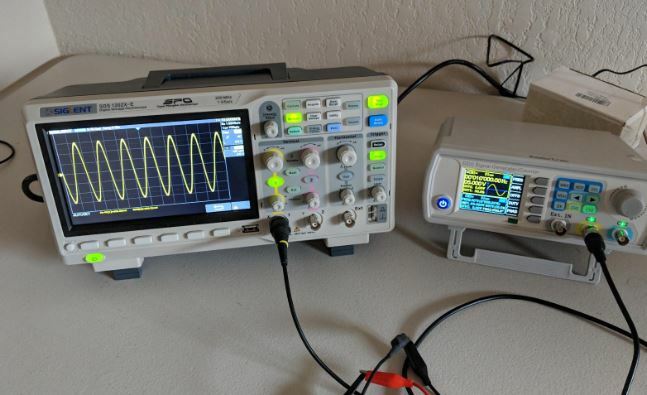 Though this oscilloscope is mostly made for people on a budget, in a fair comparison, its construction actually compares with some of the most expensive digital oscilloscopes you’ll find out there right now. Ideal for those who are concerned about the ruggedness of their instruments. The Rigol DS1054Z measures 13 x 7 x 5 inches and weighs just over 6.6lbs. In terms of its construction, it’s a pretty straightforward 50MHz digital oscilloscope. The 4-channel design includes 1 GSa/sec and 24Mpt memory sampling; a pretty formidable pairing for anyone looking for a digital oscilloscope of this caliber. Which is why the DS1054Z is actually their bestselling instrument over the past four years, and one of the most popular instruments in the industry. Much of its high usability is the result of the display. It uses 800 x 480 pixels, which keeps things pretty clear, even if you’re trying to look for small variations in data. And it’s a display that other brands have copied in the years since the DS1054Z became so popular. In any case, the quality of the display isn’t only about visibility, it also means usability is improved in a much broader sense. For expandability, the depth of memory at 12Mpts can be upgraded to 24Mpts with the addition of another part, the MEM-DS1000Z. Technically speaking, you’d need to pay an official Rigol dealer to install that memory. But that’s a minor inconvenience for the potential of being able to expand your instrument as necessary. The DS1054Z includes four sets of probes, helping provide a peak 30,000 wfms/s waveform capture. Dollar for dollar, that makes this one of the most value-driven digital oscilloscopes out there right now. At least, among 4-channel instruments. 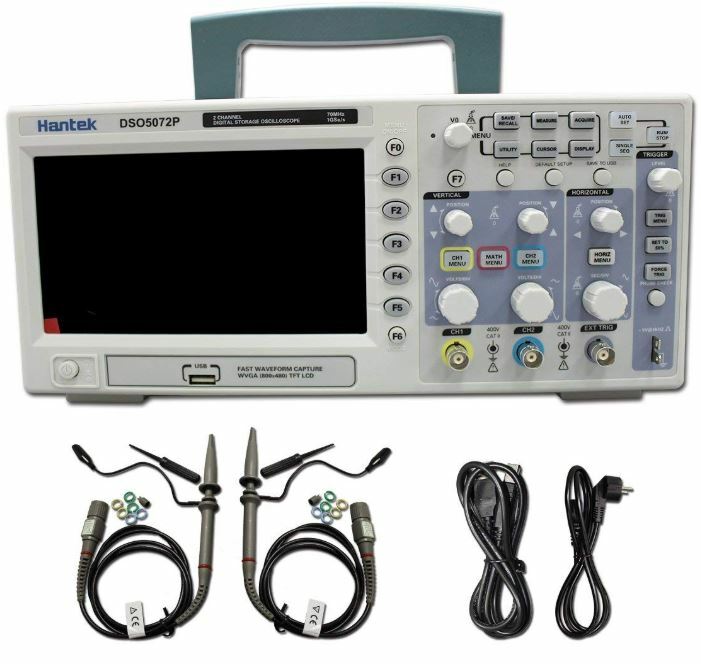 The Hantek DSO5072P is a pretty solid budget-oriented 2-channel oscilloscope. It doesn’t quite have handheld portability but it does have modestly impressive features. Whether you’re going to need to move your data to another device or not, it includes everything you need to get started with more hands-on operation. Though the interface of this device might not be good for novices, it’s approachable enough for professionals. Similar to the Hantek DSO5072P, the Siglent Technologies SDS1202X-E is another pretty solid 2-channel digital oscilloscope. But unlike that instrument, its capabilities extend far further than 70MHz of bandwidth. It’s actually capable of accommodating 200MHz while retaining many of the same essential reporting features as the DSO5072P. For people who only need that little extra boost, the DSO5072P is worth a look. Finally, the Rigol DS1054Z is a four channel instrument. Except its price is more reflective of a two-channel instrument. The interface is a lot friendlier and approachable than any other digital oscilloscope on this list. Everything is well labeled, from the interface to the full color display. Sure, you’re limited to a relatively small bandwidth of 50Mhz. But dollar for dollar, when you’re looking for a four channel digital oscilloscope, this instrument stands out for a reason.